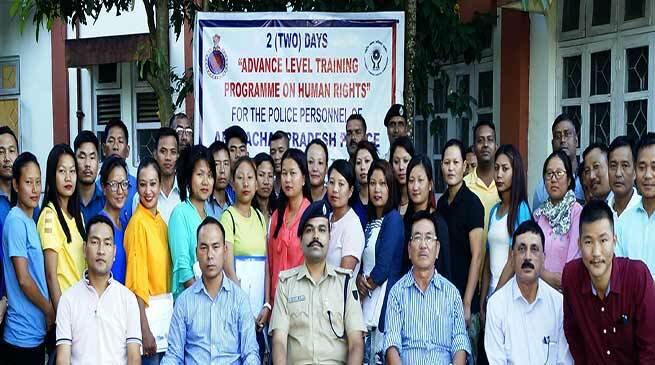 Arunachal Pradesh Police in collaboration with National Human Rights Commission(NHRC),Delhi successfully conducted Two days Advanced Training Course on Human Rights at PTC Banderdewa from 9th Nov’2017 to 10th Nov’2017. Speaking at the valedictory session, Principal, PTC Dr. Navdeep Singh Brar, IPS, exhorted the participants to respect Human Rights in their personnel and professional lives, as he stressed that, Human Rights starts at home. He thanked the DGP, Arunachal Pradesh for envisioning and planning the training programme. The 2(Two) days training module covered the critical Human Rights aspects on origin & developing of Human Rights, role of the police, guidelines/legal provisions of arrest & custody management, Parole& rights of under trials, rights of vulnerable sections, women, children, SC/ST etc. 54 police officers from various districts of Arunachal Pradesh in the ranks of Cts to DySP/ASP participated in this course. In order to impart professional training experts were invited from the Guwahati High Court, Rajiv Gandhi University, State Commission for Women and also senior police officer. DySP (Trg) Shri Dusu Kaling and other officers of PTC were also present during the valedictory session.